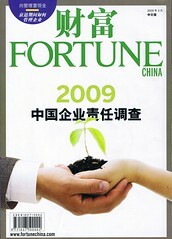 This is Fortune China’s 3rd annual survey of Chinese business leaders. This year Fortune surveyed 20,000 people using a survey designed by AccountAbility. The cover this year is much more uplifting than last year’s. Download the full English version here. The Chinese version is on Fortune China’s website here. On a rainy London night in a room of 150 people interested in China, I found myself the only person–in the audience member or on the panel,with any optimism about China improving its natural environment. The event, “Media Talk: Has western coverage of the China story become stale and cliched?” was hosted by the Frontline Club and featured Rob Gifford (NPR), Duncan Hewitt (former BBC, Newsweek), Catherine Sampson (formerly The Times) and Lifen Zhang (FTChinese.com). It was moderated by Carrie Gracie (BBC). I don’t think top-tier western media coverage of China has become cliched, but much of it has become stale. A bit of fresh air is just what China and the world need right now. You are currently browsing the Joshua Wickerham weblog archives for the media category.